The NOAA Ocean Surface Bundle (OSB) Climate Data Record (CDR) consist of three parts: sea surface temperature, near-surface atmospheric properties, and heat fluxes. This portion of the OSB CDR is the NOAA Climate Data Record (CDR) of Sea Surface Temperature - WHOI. The SST data are found through modeling the diurnal variability in combination with AVHRR observations of sea surface temperature. The data cover a time period from January 1988 to present at a 3-hourly, quarter-degree resolution. Cite as: Clayson, Carol Anne; Brown, Jeremiah; and NOAA CDR Program (2016). 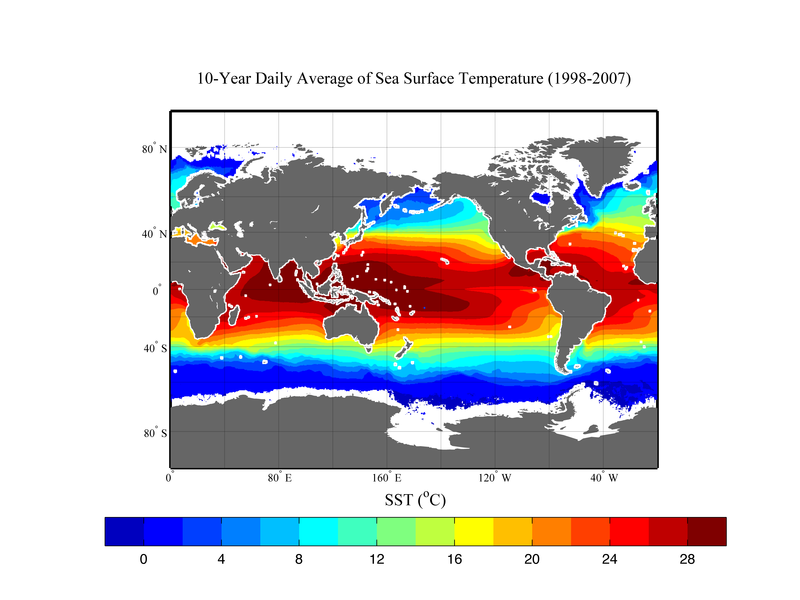 NOAA Climate Data Record (CDR) of Sea Surface Temperature - WHOI, Version 2. [indicate subset used]. NOAA National Climatic Data Center. doi:10.7289/V5FB510W [access date]. Purpose Current dataset provides advanced scientific researchers a high quality Climate Data Record (CDR) of sea surface temperature that can be used for any analysis of the latent and sensible heat fluxes and the associated surface parameters from synoptic scale through climate variability. Lineage Statement The data were produced by Woods Hole Oceanographic Institution and are archived at the NOAA National Climatic Data Center (NCDC). Updates to extend this CDR data set to the present are anticipated, pending adequate funding. For more information, see associated processing documentation. NASA Website for Surface Radiation Budget (SRB) data.